Argweld-Trailing-Shields: Titanium Trailing Shields give secondary shielding gas coverage which prevents the material from oxidizing following welding ON PIPE AND SHEET. 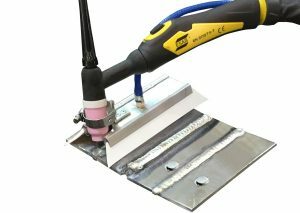 The Argweld-Trailing-Shields are designed for high quality gas coverage of titanium while welding.They can be supplied to fit any make of TIG or plasma welding torch for manual and automatic welding on pipes, vessels or flat plate. 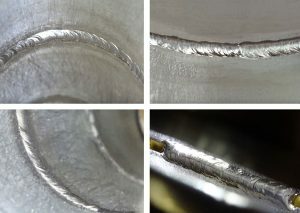 By using an Argweld-Trailing-Shields, titanium welds will be left bright and shiny and eliminate discoloration. 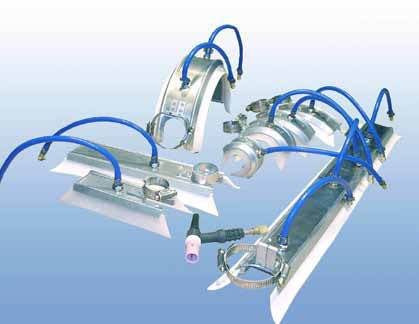 Argweld Trailing Shields will reduce gas consumption, save rework and eliminate wasted materials cost due to oxidation. Argweld® purging shields can also be used for welding stainless steel, duplexes as well as titanium and any other weldable metal where discoloration or oxidation need to be eliminated. The shields are manufactured to weld flat plate or any diameter tube, pipe or vessel. They are manufactured with variable radii to suit each diameter, contoured for either outside or inside welding. other reactive metals while welding. Each radiuses Argweld-Trailing-Shields are manufactured to suit the specific diameter of the pipe, tube, vessel or tank to be welded. They can be configured for either outside or inside welding. larger, slightly heavier versions, for attaching to automatic/mechanized welding systems. 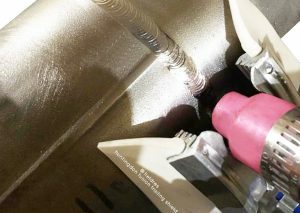 Both permit faster welding while maintaining a perfect gas shield.